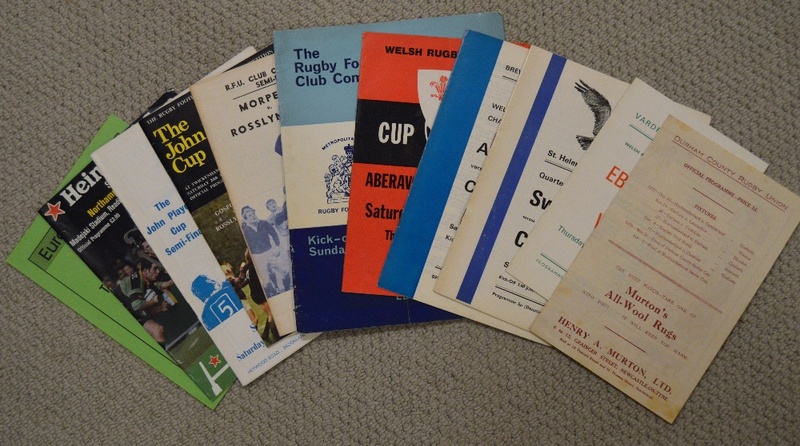 Collection of Rugby Cup Match Programmes (11): WRU Cup: Vardre v Ebbw Vale, 1971; Qtr-final Swansea v Cardiff 1974; Semi, Aberavon v Cardiff (Bridgend)1974; Final, Aberavon v Llanelli, 1975; RFU K.O. 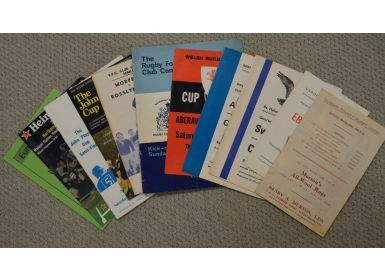 Cup: Qtr-final, Met Police v Bristol, 1973; Semis, Morpeth v Rosslyn Park, 1975 and Sale v Gosforth 1976; Final, Gosforth v Rosslyn Park (Twickenham)1976. 1938 Durham Senior Cup, Westoe v N Durham; European Cup Semi, Northampton v Llanelli, (Reading) 2000; and Euro-Rugby-Cup 1996, TSV Victoria Linden (Hanover) v Kituro Schaerbeek (Belgium). G/VG.